Definition: Pancetta – dry cured meat, similar to bacon. 1• In large skillet, heat oil over medium heat. Cook pancetta, onion and garlic 7-10 minutes, or until onion is very soft. Stir in hot pepper flakes and cook 1 minute. Pour wine (if using) over onion mixture, stirring to scrape up brown bits on bottom of skillet. 2• Stir in tomatoes, breaking up with back of spoon; bring to a boil. Reduce heat to low and simmer 25-30 minutes, or until sauce thickens. 3• Meanwhile, in a large pot of boiling, salted water, cook penne 9 minutes, or until tender but firm. Drain pasta. 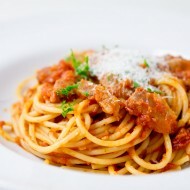 4• Toss immediately with tomato sauce, parsley, Parmesan and Romano cheeses, and serve.